Buy a condo in Conception Bay South in complete confidence with the Hann Group. Contact us today if you have any questions or would like more information on our condo buyers services. Surprisingly, given how close the town is to St. John’s and the capital city's famously temperamental weather, CBS claims to have some of the best weather in Newfoundland and Labrador! People who love to get out in the woods or on the water are particularly attracted to the area. You can go from deep within the comforts of your CBS condo to deep woods or deep water in mere minutes. What, and where, is CBS? Conception Bay South has a decidedly rural feel but yet most everything can be found there: medical centres, vets, massage therapy, supermarkets, fast food. You name it! The Town is well organized, with curbside recycling, well-maintained parks and frequent social activities. Some highlights of the year are the Kelligrews Soiree and the Santa Claus Parade. One must-see is Manuals River, with its interpretation center, guided tours and trilobite fossils. Check out more things to see and do in CBS. The population of CBS has skyrocketed in recent years to 24,000, many of them young families. To serve their needs, CBS has schools at every level. going from four primary/elementary schools to two junior highs, to two high schools. The town is also home to a large post-secondary campus, the College of the North Atlantic (CNA) in Seal Cove, which offers a wide range of courses and is also CNA’s petroleum training center. There are also dance schools, a yacht club, walking trail, a growing shopping district and an equestrian center. 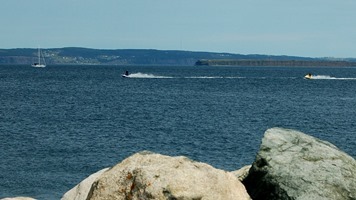 Great temperatures, small town feel and modern conveniences: Conception Bay South really does offer an exceptional life style. (See more CBS businesses) A bonus to living in CBS is that, as the town is so long and coastal, it is easy to have a great view! While there are only three condominiums in Conception Bay South yet, with so much happening it’s no surprise that CBS is attracting a lot of attention. CBS is close to all the amenities of St. John’s but still has the country living and warmer climate that so many people crave. Ready for the best of both worlds? You may be ready for a condo in CBS. Contact us for more information!